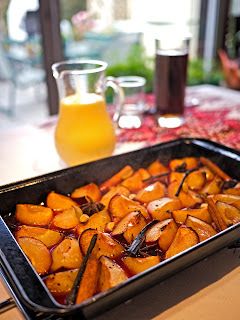 This is a lovely warming dessert, and suits me well, as I often struggle to get my Heathy Extras in each day. You can also serve this for breakfast. Quarter the plums and remove the stones. Place cut side up in a shallow oven proof dish. Split the vanilla pods lengthways and scrape out the seeds. Place in a small bowl with the pods. 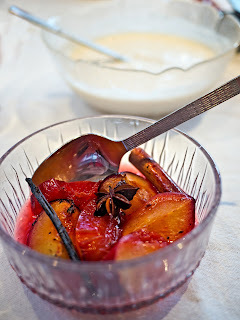 Add all the other ingredients and some boiling water (around 150ml or so) and pour gently over the plums. Bake at 200°C for 10-15 minutes until the plums are soft but still holding their shape. Serve with fat free yogurt.